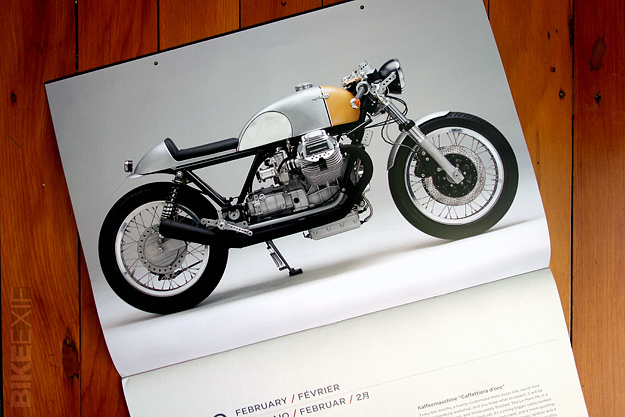 Chris Hunter at Bike EXIF – curator of the best custom bikes in the world – presents his annual calendar. 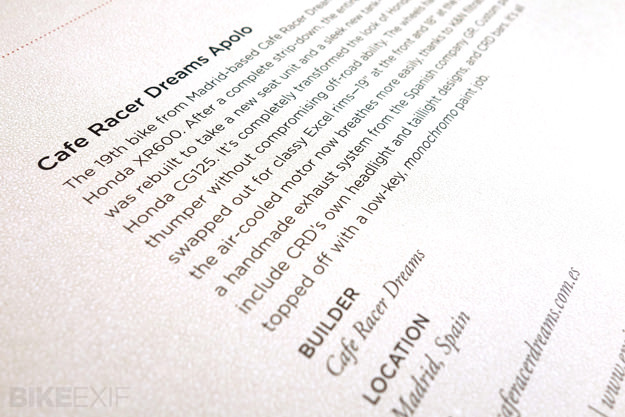 Expertly printed by Octane Press. 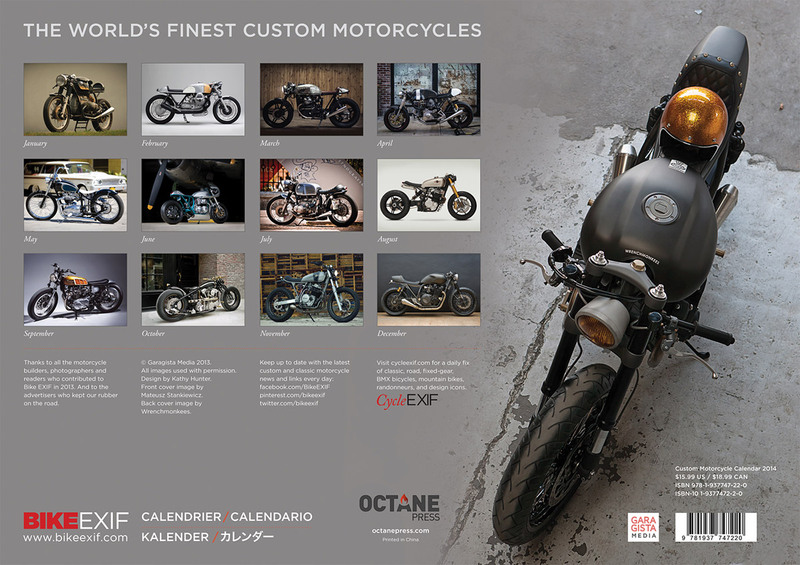 A stellar line-up of some of the best known custom bike builders (and their motorcycles) in the world. Shot by some of our favorite photographers – many whose work you’ve seen highlighted here in the past. “It’s nearing the end of the year – and if you don’t understand this agrarian concept – you need this calendar. 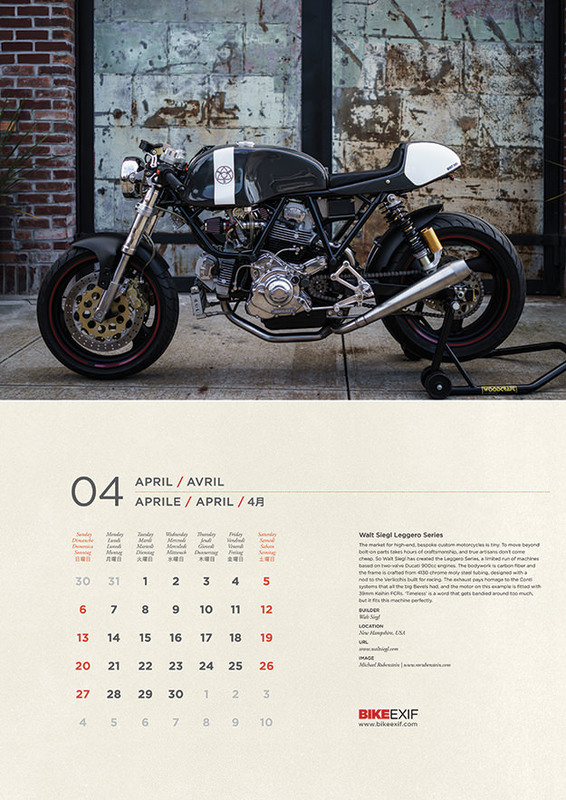 The annual Bike EXIF Calendar is a roll call of the world’s best custom bikes, shot by professional photographers. Printed on luxurious art paper, this year’s edition is larger than in the past, and measures a substantial 17 x 12 inches. 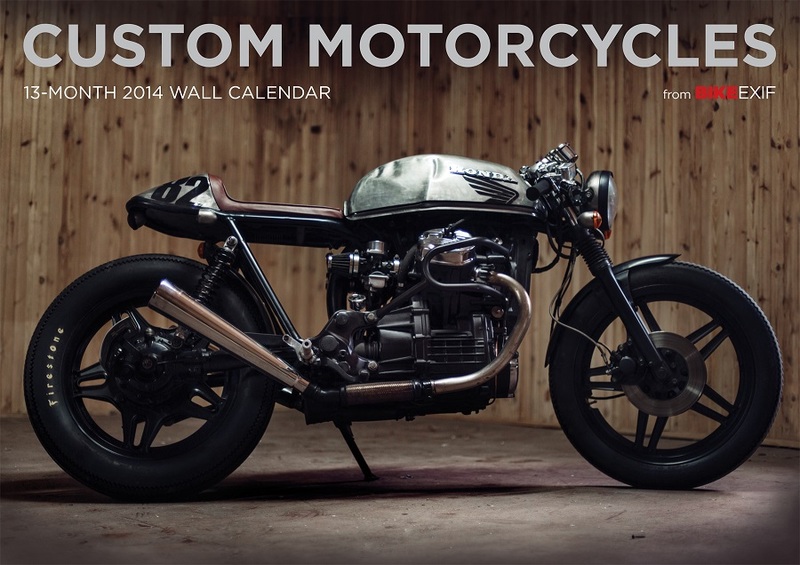 The cover bike is a custom CX500 built by Warsaw-based photographer Mateusz Stankiewicz with help from a local garage, Eastern Spirit. 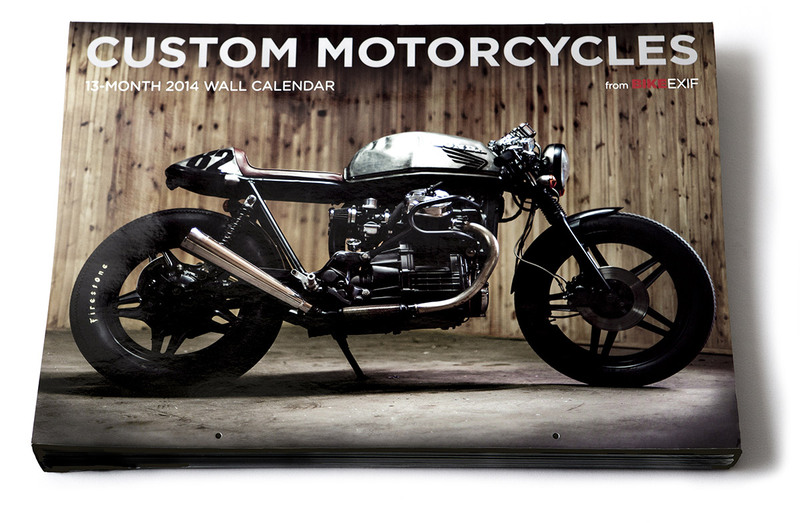 This year’s calendar includes: Classified Moto KT600, Kaffeemaschine “Caffettiera d’oro,” Wrenchmonkees Monkeefist, Walt Siegl Leggero Series, Mike Salek-built Honda CB750 custom, Rough Crafts Knucklehead, Cafe Racer Apollo Dreams (based on a Honda XR600), Factory Metal Works “MQQN Machine,” KDI Cycles CB550F, Luka Cimolini-built BMW R80/7, Wilkinson Brothers’ BMW R75/6, and a Mark Huang-built Yamaha XS650. 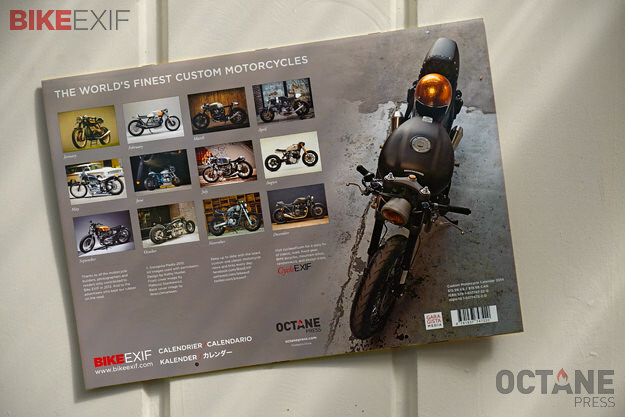 Chris Hunter runs the world’s most popular custom motorcycle website, Bike EXIF. It’s a showcase of the best cafe racers, bobbers and restorations, and features builders from the USA, Europe and Asia. In his previous life Chris was an award-winning advertising creative director, but he swapped the bright lights of Sydney, Australia for the rural charms of a small farm in New Zealand. When not writing for Bike EXIF, he rides his Moto Guzzi whenever he can.